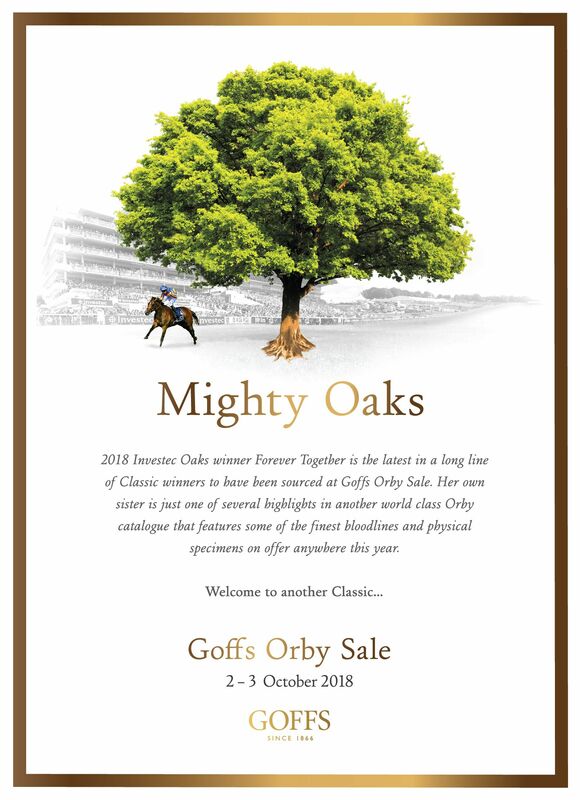 A Classic collection of 418 yearlings will be offered at this year’s Goffs Orby Sale which takes place from 2 – 3 October. Goffs is proud to present a catalogue of true strength and depth that has been drawn from the leading nurseries across Ireland, the UK, Europe and the US, resulting in a two day sale of undeniable quality. It is now available to view online at www.goffs.com. Epsom Oaks winner FOREVER TOGETHER headlined another Classic year for Orby graduates on the track and her Galileo own sister is among the stand out lots on offer in this year’s catalogue alongside another regally bred daughter of Galileo, the own sister to triple Group 1 winner, ALICE SPRINGS. This blue blooded duo feature among six fillies and five colts by the world champion sire and join yearlings by world class and first season sires such as Acclamation, Cable Bay, Camacho, Camelot, Dark Angel, Exceed And Excel, Frankel, Free Eagle, Galileo, Golden Horn, Havana Gold, Holy Roman Emperor, Iffraaj, Invincible Spirit, Kingman, Kodiac, Le Havre, Lope De Vega, Mastercraftsman, No Nay Never, Oasis Dream, Pivotal, Sea The Stars, Showcasing, Siyouni, Teofilo, War Command, Zoffany and many more. The Orby Sale quality was further underlined this week with two classy Group winning two year olds in ANGEL’S HIDEAWAY who landed the Group 3 Princess Margaret Keeneland Stakes on King George day at Ascot, and is now among the leading fancies for next year’s 1000 Guineas, while yesterday LAND FORCE was the impressive winner of the Group 2 Qatar Richmond Stakes at Goodwood. “We are thrilled with the support we have received from vendors this year as we have been entrusted with a truly world class selection of yearlings. Several leading breeders have sent us more of their best than ever and we cannot wait to present this amazing group of yearlings to potential purchasers from home and abroad. The Orby Sale commences at 11am on Tuesday 2nd October and 10am on Wednesday 3rd. It will be followed on Thursday 4th October by the one day Sportsman’s Sale which also received a boost this week with Group wins for Comedy in France and Sir Dancealot at Goodwood. The Sportsman’s catalogue will be available online from Wednesday 8th August.